Your Macbook Pro with Retina display will be a whole lot more functional with this powerful docking station. Turn your MacBook Pro into a corporate desktop system. No need to plug in cables each time you connect. Leave your cables plugged in. This quick loading DOCK brings you, a 5-port USB and Gigabit Ethernet hub (power adapter included), Thunderbolt connectivity, a Headphone port, an HDMI port, plus a Security Slot. This device works with the 15-inch MacBook Pro with Retina display model released mid-2012 or Oct 2013 (A1398). 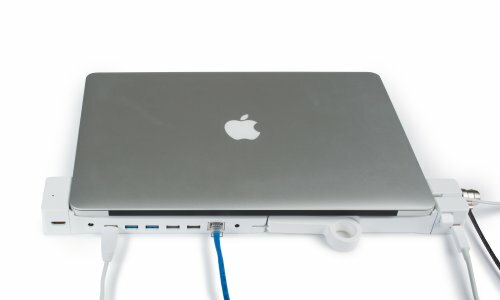 LandingZone DOCK is an adaptive and simple to use secure docking station for the Macbook Pro® with Retina display. You can return from working outside with your computer and simply snap it into the LandingZone on your desk and enjoy the benefits of an executive desktop system. NOT COMPATIBLE WITH THE NEW MACBOOK PRO WITH TOUCH BAR AND TYPE-C PORTS. Designed only for MacBook Pro Model A1425 first released in mid-2012 or A1502 first released in Oct. 2013. After docking, a few ports on the computer remain accessible without the docking station: a Headphone port, SDXC card slot, a Thunderbolt. port, a USB 3.0 port (all separate from those on the dock), and MagSafe 2 (the dock provides a holder for this power cord). Does not work with MagSafe to MagSafe2 converter.